What is the density of titanium, actually? Titanium density can be expressed in basic figures: 4.5g/cm3, 4,507 kg/m3 or 0.163 lb./in3, whichever you are more comfortable with. Density is the main "culprit" for titanium highest weight to strength ratio among all other metals, especially regarding the weight component. Titanium is more than often compared to steel, meaning in fact iron, as regarding strength to weight ratio. What everybody knows about the density of titanium is that the metal is half as light than steel. What is not known by everybody, but I'm going to share with you today, is WHY is titanium half as light as steel. We will need to zoom in down to the atomic level of the element titanium in order to accomplish that. Down there we first find out that atoms are not as different as one may think when looking at the great difference in appearence, structure, texture of the many elements studied by science. Each of them are made basically from the same particles – neutrons, protons and electrons. And all these particles have the same weight for all the elements. Actually, electrons weigh next to nothing so we will disregard them from now on as they contribute less than 0.06% to an atom's total mass. As neutrons and protons have pretty much the same weight in all the atoms across the periodic table of elements it’s clear that the sheer number of each of these particles is the cause of different weight. And the truth is that each and every element has a different number of neutrons and protons. Coming to the point, the most stable isotope of titanium element, known as TI 48, has 22 protons and 26 neutrons, while iron has 26 protons and 30 neutrons, making a grand total of 56. Having established that the mass of the protons and neutrons (nucleons) is the same, we discover that atomic mass is not accountable alone for the lightness of titanium versus iron as the difference is just of 8 particles units of weight, accomplishing a mere 14% of the expected 50% in weight difference that titanium is accounted for. Fact is, titanium density, and density in general is never accounted at atomic levels. And, of course, we usually never use anything in a single atom form. I rule out you being a trained chemical specialist working in a neutrino accelerator facility. So, the explanation of titanium density comes from the way atoms are arranged together when forming different pieces of material. 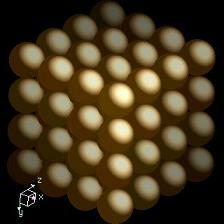 And this is directly related to the structure of electrons layers that surround the neutrons and protons of the atom. Protons and neutrons make the atom nucleus which is surrounded by electrons which form a kind of electron cloud. The electrons are positioned in this cloud at different distances from the nuclei, in layers which are usually called shells or energy levels. Only the outermost shell of the titanium element is interesting for explaining titanium density. A simplified form of describing the electron distribution of the titanium element is that is has four layers containing, 2, 8, 10, and respectively 2 electrons each. 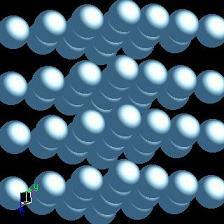 Iron has also four layers containing 2, 8, 14 and 2 electrons. Not that much of a difference, isn’t it? Well, there is a direct correlation between electron concentration and crystal structure, and that’s where the difference becomes decisive regarding titanium density versus iron. Titanium exhibits a hexagonal close packing (HCP), while iron has a cubic close packing (CCP) crystal structure. The difference in crystal structure in how the sheets of atoms are stacked upon one another is enough to account for the great reduction in density that titanium exhibits over iron. As for the strength, as it happens titanium hexagonal close packing matches iron cubic packing are the two structures that allow the highest number of atoms than can be packed in a fixed volume.